We’re almost done with this series, and I might not get to the secondary portion until after the first game. We have a few different posts planned for tomorrow and that one might not make the cut. For now, you get to know the Washington Husky linebackers. This is a little difficult to decipher who’s a linebacker, who’s a safety and who’s injured. I’m going to go from the two-deeps that the Huskies released on Monday and I’ll also include a freshman you may have heard of. As usual, the starters are first. Feeney was a top player on the scout team a year ago, as he red-shirted. He was moved during camp to play linebacker because of the injuries. He was a safety until he was moved and I think he’ll play a position where he’s able to cover the slot receiver and is used in passing situations more. He is listed as the starter but expect him to split time with Shaq Thompson. Also, this is Nate Fellner’s position and once he comes back from injury, Feeney will have a battle on his hands. Timu was thrown into the storm last year and played fairly well for being a true freshman. Coaches have raved about him this off-season and his teammates must feel the same way about Timu because they elected him a team captain. I expect Timu to have made a huge improvement over last year and be a leader on this team. He’s the ‘quarterback’ of the defense and I would bet that he’ll lead the team in tackles, barring injuries. Princeton challenges for the coolest name on the team and is also the most experienced linebacker. Fuimaono had a decent sophomore season and figures to improve this time around. He has been slowed for most of camp because of a hamstring issue but seems to be on the mend. Princeton is a guy who will definitely need to play against the power teams. He isn’t as quick in pass coverage as the converted safeties, but I’m betting he’s better against the run. Shaq is listed on the depth chart as a nickel back (which is a 3rd corner, essentially) but expect him to play more of an outside linebacker while lining up all over the field. I could list Thompson in the secondary, but he’s been doing drills with linebackers recently and I think, to the less educated eye like mine and most fans, he’ll act and appear more as a linebacker. Matthew and I have written about Thompson in a couple of different places. I think he’s a game changer and the coaches seem to, as well. He may not be a game changer this year but he’ll show flashes of that. Shaq will make mistakes but he’s the type of player the Huskies haven’t had on defense in a decade. I think you could call this defense a 3-4, a 4-3, a 3-3-5, or a 4-2-5. I tend to think of it simply as a 4-3 but that puts in Shaq with the linebackers. Expect 2 of the Thompson, Fuimaono, and Feeney trio to be on the field most of the time and Timu being on the field almost all of the time. All of these guys will see time on the field. Tutogi came to U-Dub last year after transferring in and could be a solid contributor. 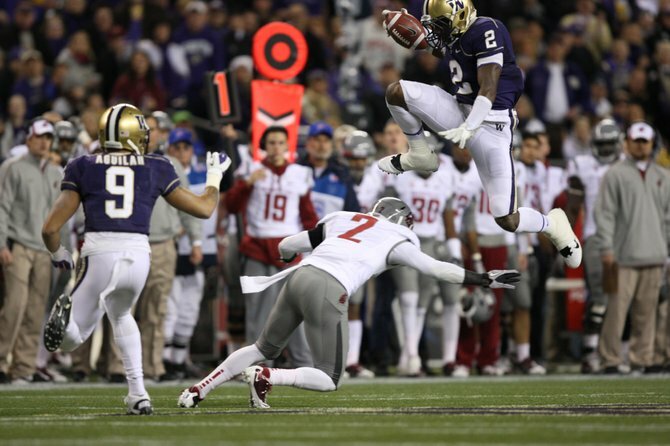 He will definitely see time on special teams (he blocked the punt in the Apple Cup). I think Tutogi will play more and more as the season goes on and he’s more than a capable back-up. Taz was moved off of the safety position and is playing the same position Feeney and Fellner are playing. He played quite a bit his freshman year but was injured a good share of his sophomore year. Fellner was going to be a starting linebacker before suffering an injury in camp. He may be back by the third or fourth game. Fellner is a veteran who always seemed like he could be a good linebacker. In a quest to get the best 11 players on the field, the coaches moved him there this spring and he seemed to transition well. I hope he can make it back and I think the defense will be better if it does. All of these guys suffered injuries in Fall camp. Tutogi and Taz are healthy now but their injuries put them behind a little bit. Linebackers. The bane of last year’s defense (at least on the field) do look improved, but they have plenty of issues as well. After receiving a bunch of new bodies from the safeties this spring, they proceeded to average an injured linebacker a day through much of fall camp. Nate Fellner and Jamaal Kearse are still out for a couple of games, but everyone else is now back. The enlarged John Timu at middle linebacker has been drawing accolades and should be the one constant throughout the year. Princeton Fuimaono is probably the number two guy right now. Former safety Travis Feeney is holding down Fellner’s spot, although Shaquille Thompson will take over a good share of the time in the nickel package. There’s talent, speed and athleticism here. Now it just needs to translate to tackles. The offensive tackles. File this under lack of experience as well. Both tackles, Micah Hatchie and Ben Riva, left and right respectively, have seen little or no game action. They have lots of talent and the practice reports are good, but only games will show if they’re actually ready. I’m optimistic, but without Chris Polk, this line needs to be a strength. Unless these two excel, it will likely be average at best. Camp is almost half over and the first game is 2 weeks away. It seems as if training camp has brought a new injury with it everyday. When you list everything out (which I will do after I run through the wide receivers) it doesn’t look as bad as what the perception is. I’ve written about quarterbacks, running backs, and fullbacks so far in this series and I move on to receiver today. The position is going through what seems to be a little bit of a face lift this year, with Jermaine Kearse and Devin Aguilar graduating. Those two had very good careers at U-Dub, although they both came with their fair share of frustrations. Most fans agree that, while the 2012 group is young, they have a good amount of talent and shouldn’t see a huge drop off in production. On to the names! I’ll include most players (I will probably leave off some walk-ons who I don’t see as contributors this year). The order I list them is in the order I perceive as the current depth chart. I was just reading Ted Miller’s blog (which is fantastic) and he was asked to compare Kasen Williams and Marquess Wilson. He said that it wasn’t a fair comparison in comparing someone who is an All-American and someone who is mostly based on potential at this point. This is exactly right. Kasen Williams has as much potential as any receiver in the Pac-12 and maybe the country. No, really he does. He flashed it at times last year but he has hardly proven himself. He’s not in the Pac-12 elite but I would be surprised if he wasn’t in that group by the end of the season. Every Husky fan (and a few WSU fans) have the picture of Kasen leaping over a defensive back in the Apple Cup cemented into their memory bank and these are the type of plays that we hope to see all year. Last year, Kasen caught 36 passes for 427 yards. I expect him to double those yards. By all accounts, Williams should be a star at some point, the question is if that will happen this year. I sure hope so. James Johnson has had an interesting career as a Husky. He scored the first touchdown of the Sark era, as a true freshman. Johnson then went on to have a great freshman year (39 catches for 422 yards), particularly in the first half. He was then injured before his sophomore year and somehow got lost in the mix at the position. He never really saw the field, aside from a few plays here and there. Last year brought something of a comeback for Johnson (28 receptions for 366 yards). He would have a few great games (Nebraska comes to mind) and then disappear for a game it seemed. He did miss a few games due to injury. This year is off to an ominous start, as he’s suffered a dislocated wrist and a few torn ligaments. Sarkisian said that he’ll be out 4-6 weeks. This is a blow to the Dawgs for the first few games as most people had James penciled in as the number 2 receiver. Speaking of interesting careers, I’m not sure any player could top Bruns in that category. Cody Bruns played in his first game half way through his freshman year because Ty wanted to run some trick plays. Cody would get on the field for about 3 plays a game and it wasn’t usually to catch passes. Bruns was a bit lost in the depth his sophomore year and then played a little more his junior year. He’s been labeled as a player who could do everything from holding on field goals, to passing the ball, to punt coverage, to actually receiving. Last year, he was dealt an emotional blow as his father passed away. The coaches and Bruns decided that a redshirt year would be best for all involved. Now Bruns enters his last year and figures to be an integral part in the receiving corps. He may be used in a more conventional way than usual but don’t be surprised to see him be on the field in many different capacities. He has surprising speed and is said to be a sharp route runner. It’s easy to forget that Kevin Smith didn’t play all 4 years of high school football. He started later but his athletic ability made up for however raw he was. Now he’s an upper class-man who could be a pretty big contributor (208 yards receiving last year). Smith is still recovering from an ACL injury and could be limited for the first month of the season. If he does come back to 100% healthy, there’s no doubt in my mind that he’s one of the Huskies 4 best receivers. You may also see him back returning kicks and showing off his speed. Mickens was rated as a four-star recruit coming out of California and has been turning heads in the first 2 weeks of camp. He has even been running with the starters in the last couple of days due to injuries ahead of him and his good play. Mickens is the smallest of the receivers (5-10, 170) but has a ton of speed. He’s almost assured to play this year and I wouldn’t be surprised to see him start in 2 weeks. Much of what I said about Mickens rings true for Taylor. He was a highly rated recruit coming out of Arizona who has been making plenty of plays thus far in camp. He’s also 5-10 but a little bulkier than Mickens. His high school mascot was a Husky so that’s cool, I guess. Taylor will see plenty of playing time, especially as Johnson and Smith work their way back as the season progresses. Sure, these 2 freshmen probably have their best days a few years down the road but we don’t have the luxury to wait for that since the Dawgs need them now. I’m guessing they’ll come through with only a few hiccups along the way. Just in case anyone missed Matthew’s post below, here is the link. I can’t say enough about the post. If you haven’t read it, go do that now. Today we get to know our Dawgs who play fullback. This falls at a convenient time since there are two of them and I’m on vacation so I don’t really want to write that much. Suckers. With that being said, there is a few notes after the jump about the first week of the Huskies training camp. Who scored the first touchdown of the 2011 Husky football season? If you had Jonathan Amosa in that pool, you were probably the only one. You were also correct. Amosa was thrust into the starting role last season after Zach Fogerson retired due to injury. The word I’d use to describe Amosa’s play is adequate. He got the job done but nothing too much more. He seemed like he blocked pretty well but he’s nowhere near the Stanley Havili type player that Sark had at USC. He came to U-Dub as a walk-on but was awarded a scholarship two years ago and has since became a regular. He seems like a good guy to root for. I would expect him to be on the field about half of the offensive plays, splitting time with Dezden Petty and off the field when the Dawgs go with a one-back formation. Psalm has the best name on the team. That’s a quality that really can’t be looked over. While Amosa is adequate, Wooching has a chance to be something more. He could be more of the Stanley Havili type I had mentioned above. With that being said, it looks as if this Hawaiian is headed for a redshirt year. I’m excited to see what Psalm could become but that might not come for another year or two. Well, it took me 2 days but I finally made it through all of the USC game. I can only wonder how many times I would watch it if it wasn’t a busy week. Anyway, I came away with a few more thoughts that I’ll share before putting this game to rest and moving on to this week’s opponent, Arizona State. Let’s start with the worst part of the game, the rushing defense. There’s no denying that they were terrible. After watching it again, it was very clear that the problems weren’t because of a lack of schemes. They tried just about everything. They put at least 8 guys in the box every time. I counted 10 guys in the box for several plays. 10 guys! They also tried a 3-4 several times to be a little more athletic. The problem was with what was happening on the field. The defensive line was terrible. Ta’amu played a decent game, but the rest of the defensive line was awful. There were guys getting pushed back 5-10 yards every play. Then, the linebackers seemed a bit timid. They didn’t attack the runner for most of the game, they let the runner come to them. By the time the runner got there, those linebackers were blocked. I understand that they can’t completely sell out against the run because they have to watch for play-action, but their reaction time does need to be quicker. Last but not least, the tackling was terrible. It was just as bad as it was against Nebraska, if not worse. I was on a mission to count the missed tackles but I lost track. I lost track at the end of the first quarter. One more negative thought on the defense before we move to brighter spots. I think several players had the worst game of their career on Saturday. Nate Fellner had one great pass break-up, but the rest of the game he struggled. He was sucked into the wrong position and missed quite a few tackles. Quinton Richardson missed an easy sack on Barkley because he forgot he had arms on the play. He was taken out after that, I’ll be interested to see if he plays as much the rest of this season. Where is Adam Long? Cort Dennison looked a little rusty and slow after missing the Nebraska game. Those players, along with the defensive line, were beaten up pretty well on Saturday. Thank goodness we have Mason Foster. With all that, give credit to the defense for not allowing a touchdown in the 4th quarter. They buckled down and made some stops. There’s no doubt they need to get better, but they made some plays that kept the Huskies in the game. The Huskies got their first win of the year last night at Husky Stadium against Syracuse, 41-20. The Dawgs’ struggled early on; there wasn’t any offensive rhythm and special team’s mistakes led to an early 10-0 lead for the Orange. But, then the Huskies found it. They played like the team we had planned on seeing this year. They outscored Syracuse 41-10 through the rest of the game and it wasn’t much of a contest after the first couple plays in the second half. Jermaine Kearse had a monster day (9 receptions for 179 yards), as the offense used big plays to dominate. The defense was solid too. They gave up two or three big plays but the two touchdowns Syracuse scored were because of a special teams penalty and a turnover.